I have decided to test the camera mount from inside the airplane, not the least because it lessens the risk of dropping, breaking, or in some other way damaging a $300 - $400 camera. I think I also prefer the in-plane view with commentary and radio traffic included. That means I will need a camera with an audio input jack, which I don't currently have, but them's the breaks. I went ahead and bought the more robust mount from Servo City. The other one just wasn't going to be solid enough. 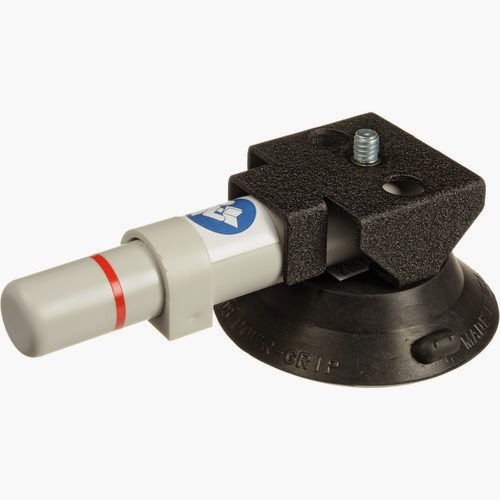 I've also shopped around for a good, and I mean very good, suction cup mount. I don't want it to add excessive vertical length to the mount for fear that the camera view will be limited to the instrument panel, and I don't want it falling off. I also has to be affordable - you can easily spend hundreds on these things. The picture makes it look gigantic, but consider that the stubby bolt protruding from the center is only 1/4" in diameter, so this picture is slightly above actual size. I will add at most one inch to the vertical measurement of the all-up mount and pan & tilt stuff. I like it because it is pump activated, and the pump doubles as a suction indicator. If it is getting ready to drop, the red line becomes visible and you just pump it again. It reportedly can carry up to a 15 pound payload - whatever camera I end up mounting to it (it won't be the one I'm testing with) will weigh less than a pound, and the pan & tilt mechanism won't add a whole lot more. Even at two pounds combined, pulling six G's would rip the wings off of the airplane but this mount would still be within published specs. The servos are pretty jumpy, some of which is caused by my trying to hold the mount steady against the canopy, but the rest is electrical. I also still have the problem of the centering springs on the joystick wanting to constantly return the camera to its center rest position. I'm thinking that I can address that by adding a switch the only applies power to the servos while a momentary switch is held down. That way I could position the camera where I want it, then just let go of the button, Tapping the button would re-center the camera. Future versions could include a handful of 'memory' buttons that would store the current camera position and return the camera to the stored position when pressed. That experimentation I did a couple of years ago with the Arduino prototyping board would come in handy for that!